Several jihadi websites posted these pictures. 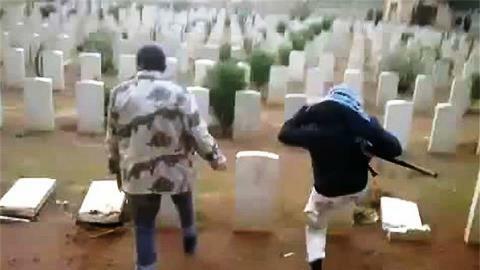 Some include Islamic State members using sledgehammers to destroy gravestones and efface the crosses carved on them. As usual, Islamic scriptures justifying the Islamic State’s actions accompany these pictures. Islamic assaults on Christian cemeteries is not an uncommon phenomenon. Read here about recent ones in Iran and Libya. Even in Germany, Muslims are demanding that Christian symbols and crosses at a cemetery be removed or covered up during Islamic funerals.